Is there luggage storage in/around Matsumoto Station and Matsumoto Bus Terminal? There are coin lockers inside and outside of the train station. See this station map and Useful Trip Info page for the details. Coin lockers (cannot be used overnight) are located just the Bus Terminal in the area just next to the ticket counter entrance. Is there luggage storage at Matsumoto Castle? Coin-operated lockers for smaller items are located on the castle grounds. Larger bags can be left at the shop on the premises, but they ask that you remove valuables and fragile items. Are there coin lockers at Kamikochi? There is a baggage room (tel: 0263-95-2034) on the first floor of the Kamikochi Bus Terminal, but there are no coin lockers. Rates are by the day. Small: ¥350 / Medium: ¥400 / Large: ¥500 (¥600 for oversize). The office is open from 6:00 a.m. to 5:00 p.m.
Are there any courier services like FedEx? „Kuro Neko (Black Cat)“ Yamato Transport Co. has an English website. The luggage would be sent to your destination (hotel) by the next day. Be sure that you first confirm whether or not your lodging will agree to receive your luggage. Otherwise, we recommend a convenience store drop-off/pick-up option if a convenience stores is close to your destination. Can you recommend good view points to see the Japan Alps? Besides the park and keep of Matsumoto Castle, Joyama Park, and Alps Park are good points for views of the Japan Alps. You can enjoy a spectacular view from the top point of a hiking course from Asama Hot Springs. A great, yet little-known spot downtown is a top garden of Performing Arts Center. The second floor of the Matsumoto Folkcraft Museum is a place to see the Japan Alps and grape orchards through the beautiful window. The Baba Family Residence is a good viewpoint where you can see both Mt. Yari and Mt. Hotakadake, the two highest summits of the Japan Alps. What areas/places are flat and allow for wheelchair/stroller access and/or the elderly to get around easily? Nakamachi and Nawate Streets in Matsumoto and Narai Post Town in a part of Shiojiri in the Kiso Valley are flat, old streets that are good for strolling. Also, Agatanomori Park near the Matsumoto Museum of Art is a good place to go around even in a wheelchair. On the farm visits front, other than the Diao Wasabi Farm in Azumino, you’ll need to go by bike, taxi, or car. Apple picking is available in the fall (Oct and part of Nov) at Yokoya Farm. They speak basic English. In Azumino City, you can do apple picking anytime at Azumino Fruit Farm. Download this Azumino Multilingual Leaflet for more details. English is spoken at Ogurayama Farm, a member of WWOOF. In Shiojiri, a southern neighboring city of Matsumoto, many grape orchards for tourists are open from late August until mid-October. One of them is located 15-minutes walking (or a few minutes by taxi) from Shiojiri Station. There is also a petting zoo at Tirolean Forest in Shiojiri. What’s the best place in town for viewing cherry blossoms? When will they bloom? Matsumoto Castle is famous for cherry blossoms. Joyama Park and the Susuki River are popular among the locals for enjoying cherry blossoms and BBQs. Mt. Kobo and Mt. Hikarujo (in Azumino City) are also popular, and there are good hiking courses among the cherry trees. Mid-April is probably the best time to see them (but it depends on the year and place). See our Cherry Blossoms page. What is the wait time to enter the castle? Matsumoto Castle has a small capacity because there are only steep and narrow steps for going up inside the keep. So it is crowded during holidays especially Golden Week (around April 29 to May 5) and Obon (around August 13 to 16). 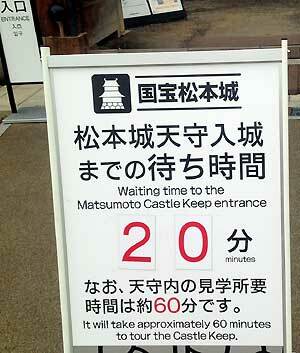 You may have to wait anywhere from 20 minutes to 2 hours to enter the castle. The waiting time is posted outside of the castle’s main gate (kuromon) as shown in the photo and on the official Japanese website. Peak visiting hours are generally from 10:30 a.m. to 3:00 p.m. Last admission is 4:30 p.m., but this is pushed forward to 5:30 p.m. during Golden Week and around the second week of August and Obon. Lunch time might not be so crowded, though it depends on other factors. For instance, when a big tour group comes, it is crowded. Is there anything else to do at the castle? In addition to the castle’s museum and shop, events such as live music performances, ice sculpting, soba festivals, tea ceremonies, samurai parades, and more are held on the castle grounds on several days every month. Check out our Facebook events page or the castle’s English Event Information page for upcoming event information. You can see Ikegami Hyakuchikutei, a historical Japanese house which has a full-scale tea-ceremony room (chashitsu) with a tea garden, located just across the street on the castle’s north side. You can often see an armored samurai, a ninja, and a kimono-wearing princess (Omotenashi-tai – see more here) and take photos with them. Also, a rickshaw puller is sometimes waiting in front of the castle’s main gate to give rickshaw tours. Can I go to Kamikochi in winter? Kamikochi’s public facilities are completely closed in winter (Nov 16 to mid-Apr). You can only enter there on foot. You need snowshoes, other appropriate equipment, and winter hiking experience. There is a risk of avalanche, so it is recommended that you go with an experienced person or guide only when conditions are good. There are local guided tours through Kamikochi offered by companies including Little Peaks (Japanese site) in winter. The closest place to enter Kamikochi during the winter is Sawando. You can get to Sawando from Matsumoto Station by bus. Then, take a taxi to Nakanoyu (no parking lot) and walk from there. It takes 6–8 hours for a round trip from Nakanoyu to Kappa Bridge. Norikura Highlands and Shirahone Hot Springs near Kamikochi are open even in winter and accessible by bus. Can I go to Kamikochi before the opening ceremony (Apr 27)? Yes. Facilities like the information center and some restaurants are open, but most hotels are still preparing to open. There is still some snow on the trails (due to the weather and altitude), so just be sure to have proper footwear. It is a great time to go, because it is not busy (there are few Japanese tourists, but some foreigners including those in tour groups are there). Is there snow in May, June, and October in the Japan Alps? Tall mountains (around 3,000 m) like Mt. Yari, Hotaka, and Jonen are covered with snow from around mid-October until the later part of June. There is a risk of avalanche, so it is recommended that you only climb such mountains from July through September. From April to June and from October to November, you can hike in areas lower than 3,000 m, such as Mt. Hachibuse and Utsukushigahara, even if there is snow on the trails. I want to camp in Kamikochi. Should I book a spot for my tent in Konashidaira or Tokusawa-en campsites? If you have your own tent, you don’t need to worry about booking a spot. These campsites don’t accept bookings for their free tent spots. More than several hundred tents can be pitched, and they do not fill up even in their busiest season. Konashidaira has small rental tents and mats, but they can’t be reserved. Tokusawa-en has fixed tents and you can reserve them. I want to stay in a mountain lodge (yamagoya). What kind of facilities do they provide? Should I reserve it ahead of time? Yamagoya provide the minimum facilities and service for climbers, so you can use bedding (futon, no bed), food, and water (no shower). Usually you don’t have to book in advance, because yamagoya must accept any climber without reservation for climbers‘ safety (but you should reach the yamagoya early in the afternoon: before 3 p.m. if possible, 5 p.m. at the latest). Do you have any advice on a good one-day intermediate hike? How about Mt. Yakedake, a volcano in the Japan Alps about 10 km hike from/to Kamikochi? Refer to this webpage. It is an active volcano, but less dangerous than other mountains like Mt. Asama and Ontake so you are able to climb to the top. Another suggestion is Mt. Norikura. It is at a high elevation (3,026m), but not especially difficult, because you can go up to a 2,700-meter point (Tatamidaira) by bus. It takes only 2.5 hours from/to Tatamidaira. Going down to Sanbon Fall Bus Stop (1,900 m) is a good one day hike (5.5 hr, 10 km). You can also visit our Hiking page for a more comprehensive list of hikes in the area. Are there any multilingual hiking guides available? Northstar’s Alpine Lodge in Norikura, where the owner and some workers are English native speakers, offer tours such as hiking in summer and snowshoeing in winter. For private guides for hire, see Guides. Is there any halal or vegan restaurants/food? The owner/chef of restaurant Doon Shokudo Indoyama is Indian and offers a halal chicken curry and vegan gluten-free, nut-free menus. Healthy Penguin Cafe offers vegan food and is located just off of Nawate Street not far from the Castle. Some other restaurants have vegetarian menus. See our Cuisine page for listings. Halal Gourmet Japan is available online and as an app, and it introduces places offering halal and vegetarian dishes. Is there any sports bar/cafe where I can watch sporting events, such as football matches? The Irish bar CELTS near Matsumoto Station (map), Spocafé Garage near Shinshu University (map), and Old Rock Pub have big-screen TVs, but they usually show the local soccer team Yamaga’s matches and big Japanese sports matches like a World Cup match. You might be able to ask the manager to show your favorite match if it is a popular event. Are there any local craft beers? Matsumoto Brewery has been in business since 2016. They have a tap room in Nakamachi and are opening another one in the Shinmai Media Garden Building in Honmachi from April 2018. The owner also runs Old Rock so you can drink Matsumoto Brewery craft beers there, too. Are there any places with cheap drinks? Tsukiji Ichiba Shokudo, an izakaya and its annex located on the brick road with the McDonald’s near the station, have happy hour with beer for ¥100 a glass from 3 to 6 p.m. You can also get a glass of whiskey from ¥130 and a glass of sake from ¥200 at 8 Ounce Standing Bar. Are there any nightclubs or live houses? Bar & Lounge GNU, located in the building just east of the Bus Terminal, serves as a venue for live music events, DJ sessions, and dance parties. ALECX is also a popular live house, located on the B1 floor of the Nova Building along the street in front of the station. Is there a 100 yen shop? There is one on the 7th floor of the Alpico Plaza/Bus Terminal Building. Another is Daiso on the 4th floor of the building with a Maruzen Bookstore, not far from the station. There is also a Seriya in Aeon Mall and some others in the suburbs. Are there any farmer’s markets in Matsumoto? A small one is Kura Marche run by JA in Nakamachi and another small one is located on the 1st floor of the Matsumoto Station building’s Midori. Some larger ones are in the suburbs. A good one is Alps Ichiba which can be accessed from Matsumoto Station by bus. Is there a large supermarket/international foods store? AEON Mall has a large supermarket that is part of their AEON STYLE store. The mall also has a Kaldi, which stocks a number of import and specialty items. Nagisa Life Site near Kita-Matsumoto Station has a large Tsuruya supermarket that is open till 8 p.m. It is accessible via the excursion bus Town Sneaker’s western route. Seiyu is a Wal-Mart store, and it is open 24 hours. There are a lot of other modern local supermarkets such as Delicia – one of which is located in the bus terminal building (Alpico Plaza) in front of the station. Are there any big electronics shops? Nojima is in Aeon Mall and Yamada Denki (electronics) near Minami-Matsumoto Station is a bigger shop. Edion, also a big electronic shop chain, is closer from Matsumoto or Kita-Matsumoto Station and can be accessed by the Town Sneaker excursion bus (Nagisa Life Site stop). Are there any flea markets in Matsumoto? Flea Market Shinshu (Japanese site) holds flea markets a few days every one or two months at Flower Clock Park in front of the Parco Department Store or Alps Park. Also, there are some good antique shops on Nawate Street and Nakamachi Street. Is there a mixed (coed) hot spring public bath or a hot spring hotel with a private bathroom? Awanoyu Ryokan, a famous inn in Shirahone, has an outdoor bath with milky water that is coed. You can soak in it even if you don’t stay there at night. Katsura-no-yu Marunaga Ryokan in Shirahone also has an outdoor mixed bath. Many ryokan (e.g. Tamanoyu in Asama Hot Springs and Izumiya Zenbei in Utsukushigahara Hot Springs) have a family bath and a family or couple can bathe together in their private hot spring bathroom (some have an outdoor bath). Are there any youth hostels in Matsumoto or other cheap places to stay? There is one youth hostel at Norikura Kogen Hot Springs, a backpackers’ hostel in the heart of Matsumoto City, a few guesthouses, and also some cheap ryokans. See our Accommodation Directory for more information. Does Marumo Ryokan have an email address they can be reached at? Reservations are taken over the phone (+81-263-32-0115) or by FAX (+81-263-35-2251). We would like to bring our well trained dog. Are there any places that take pets? Sakura Shimizu is a cottage where you can stay with your trained dog. If your dog is small and you have a cage, you can stay in Akanejuku in Gakenoyu Hot Spring (reservation is required). Located in Norikura Highlands, Hidamari (Japanese website) specializes in stays with pets, or you can also stay in Aobaso with your pet. Pension Poetical is also located in Norikura, and they take pets. Kamikochi Hotel in Sawando Hot Springs has two guest rooms for pets. Is there any short-term housing available? Leopalace21 offers monthly contracts for furnished apartments, allowing you to rent from 30 days. While not cheap, their 1K-size apartments make for convenient living arrangements. They have an English website. Is it possible to take a bus to Kamikochi, go for a walk, and get to Takayama in one day? Yes, depending on your schedule. We suggest that you check the bus timetables and plan your schedule accordingly. In Kamikochi, the most popular hiking course from Kappa Bridge to Taisho Pond takes around 2 hours round trip. Sightseeing buses can bring you straight to the Kamikochi Bus Terminal near the bridge. Getting off a bus at Taisho Pond, hiking to Kappa Bridge, taking a bus from the Bus Terminal to Hirayu Onsen, then transferring to a bus to Takayama is the quickest trip. See timetable for Matsumoto to Kamikochi. See timetable for Hirayu Onsen/Takayama buses. How can I access Takayama from Matsumoto? There is an express bus. See Alpico website’s Matsumoto-Takayama/Shin-Hotaka page for details about buses. Fare costs ¥3,190 one way and ¥5,660 round trip. Children’s tickets are half price. The Alpico Bus Company also sells Shinshu–Hida Alps Wide Free Passport, a 4-day unlimited ride ticket for buses running between Matsumoto, Kamikochi/Norikura, Takayama, Shirakawa-go, and some other places in Gifu. It might be convenient and cheap if you travel to those areas. How can I access Shin-Hotaka from Matsumoto? There are two direct buses a day only during peak season (mid-April to mid-May, mid-July to mid-August, and around New Year’s Day). For other days, take a bus from Matsumoto Bus Terminal to Hirayu Onsen and transfer to a Nohi Bus there. See Alpico Bus Timetable and Nohi Bus Timetable. Is it necessary to book the bus from Takayama to Kamikochi, from Kamikochi to Matsumoto, and from Takayama to Matsumoto? No. The buses do not take reservations. Is there any form of public transport (besides taxi) during winter to get to Utsukushigahara Highlands? Buses run during a few select periods in the summer only. If you stay in Utsukushigahara’s Ougatou Hotel or Yamamoto Goya Furusato-kan (cheaper than Ougatou Hotel), they have a shuttle bus service from Matsumoto Station. Be sure to reserve the bus for Ougatou Hotel as there are road restrictions in the winter, and you cannot access the hotel in your own vehicle. Yamamoto Goya does not pick up from Matsumoto Station in the winter (the pick-up location changes). See the Utsukushigahara Highlands page. How can I access Matsumoto from the Jigokudani Monkey Park? Take a taxi or bus to Yudanaka Station then take the Nagano Dentetsu Line train to Nagano Station. Transfer to the JR Ltd. Exp. Shinano bound for Nagoya. Take an express bus from the Kanbayashi Onsen bus stop straight to Nagano Station. Transfer to the JR Ltd. Exp. Shinano bound for Nagoya. More information is available in English on the park’s website. How can I access Matsumoto from Tsumago/Magome (Nakasendo ‚Samurai Trail‘ post towns in Kiso)? A local bus runs between Tsumago and Magome. From Tsumago, you can catch a local bus to Nagiso Station and take either a local train or the Ltd. Exp. Shinano straight to Matsumoto. Visit the Nagiso Town Tourism Association’s official website for timetables and more information in English. How can I access Matsumoto from the Tateyama Kurobe Alpine Route? Take a local bus to Shinano Omachi Station then take a train to Matsumoto. See the Access page’s Tateyama Kurobe Alpine Route section for details. How can I access Matsumoto from Kanazawa? Train: From Kanazawa Station, take the Hokuriku Shinkansen to Nagano Station then transfer to the Ltd. Exp. Shinano bound for Nagoya. Bus: A cheaper method would be to take a bus from Kanazawa to Takayama, transfer at Takayama, and take another bus directly to Matsumoto. See the Three-Star Route bus ticket. From Matsumoto, how can I access Takato to see the cherry blossoms? You can access the park via a combination of train and bus. From Matsumoto Station you will take the JR Chuo Line or the Super Express Azusa to Okaya Station (30 min). Transfer at Okaya Station to the JR Iida Line and get off at Inashi Station (50 min). Take a bus to the Takato Eki stop (25 min) then walk about 15 minutes to the park. The buses depart about every 20 minutes. I will arrive at Matsumoto around midnight. Is there a place in the station or elsewhere I can stay until the first train/bus? Matsumoto Station’s long, wide concourse remains unlocked 24 hours. There are no chairs, but you can stay in the concourse (not necessarily dangerous, but remain at your own risk). The waiting room is closed until 15 – 30 minutes before the first train. Karaoke boxes and manga/internet cafés near the station are open 24 hours. You can pay to stay in a private room. ALPICO Plaza/Matsumoto Bus Terminal’s waiting area opens from 4:40 a.m.
Where can I use Wi-Fi/internet? See our Wi-Fi Spots section under Useful Trip Info on the Plan Your Trip page. Where can I charge my phone or other device? There is a Starbucks in Matsumoto Station. The Gusto near M Wing also offers seating with outlets. You can also use the outlets in Alpico Plaza/Matsumoto Bus Terminal if you are waiting for a bus. Finally, there are outlets near the ATM in the Ote Tourist Information Center. Please try to keep your charging period brief as to not inconvenience others. Where are ATMs that accept international cards? / Where can I exchange money? See our Currency Exchange & ATMs section under Useful Trip Info on the Plan Your Trip page. Is there any information on the locations that appear in the manga/anime “Orange”? There are Japanese location maps of the manga and movie (separately) in Tourist Information Centers in Matsumoto. Also, you can download an app Butai Meguri that show you where the locations are. Details are in Japanese. See our in depth story on Orange. Are there any multilingual guides available for hire? Does Matsumoto have any famous festivals? Various themed festivals are held throughout the year. Some of the more lively festivals include the Asama Onsen Torch Festival (Taimatsu Matsuri), Tenjin Matsuri, Taiko Drum Festival, and the dance festival Matsumoto Bon-Bon. See our Festivals & Events page. Is there any international community or place where I can meet foreigners who live in Matsumoto city? Social Matsumoto hosts a get together about once a month. The location changes, but is typically within walking distance from Matsumoto Station. The Storyhouse Cafe is owned by an American and Japanese couple, and the cafe hosts events and meetups including language exchange. Old Rock is a pub often frequented by foreigners. There are also some churches in Matsumoto. Catholic Matsumoto Church near the castle and Matsumoto Abundant Life Christ Church are popular among local foreigners. On Facebook, you can join Nagano Prefecture International Group (open group) and, if you are living in the prefecture, The Nagano-ken JET (The Japan Exchange and Teaching Program) Collective (closed group). The Shinshu(Nagano) chapter of the Japan Association of Language Teachers has their own website and Facebook group. Are there consultation services for foreigners? The Multicultural Plaza run by Matsumoto City offers information and educational opportunities for foreigners and Japanese natives. Depending on the day, they also provide consultation services in English, Chinese, Thai, Portuguese, and Tagalog regarding issues or questions that foreign residents may have. Is there any place I can study Japanese? A private institution, Marunouchi College of Business Japanese Language School offers a 3-month intensive course and a 2-year general course. Its location in downtown Matsumoto allows convenient access for those without cars. Where can I have official documents for embassies notarized and/or translated? There is the Matsumoto Notarizing Office (Matsumoto Koshonin Yakuba, Momose Bldg. 3F, 2-5-1 Ote, Matsumoto 390-0874), but their services may not be offered in English. Administrative attorney Haruo Inoue (phone: 090-3565-7912) speaks English well and deals with foreigners‘ visas, green cards, and naturalization. MT Labs, a translation company on Nakamachi Street can translate your documents and provide certification that they have been officially translated. What should I do in case of a severe earthquake or other emergency situation? See our Useful Trip Info page’s Medical Treatment and Emergency Numbers section.